This adaptation of Stephen Fry’s comic novel about an ageing alcoholic and his apparently miraculous godson relies so heavily on voiceover that it’s practically an audiobook. 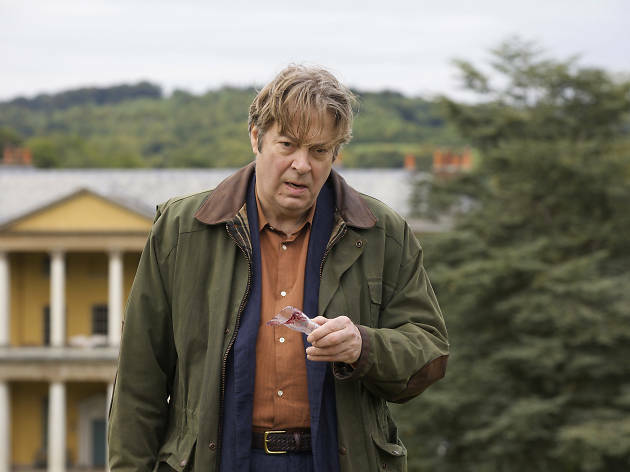 Roger Allam plays Ted Wallace, a pompous, washed-up ex-poet turned theatre critic who receives a strange assignment from a terminally ill woman. He must go to Swafford, the country pile owned by his estranged old friend Lord Michael Logan (Matthew Modine with a bizarre accent), and investigate reports that the Lord’s son David (Tommy Knight) has mystical healing powers. The supporting cast of British luvvies here is lively – Fiona Allen, Tim McInnerny and Russell Tovey all pop up in minor roles – but the script is just dull, regurgitating Fry’s book in the most lumpen, unimaginative fashion. Oddball plot twists that might have seemed fresh and surprising on the page – such as the final explanation of David’s mysterious powers – just come across as crass and silly when spoken aloud, while Allam’s horribly overwritten stream-of-consciousness narration sounds like the boozy ramblings of a judgemental creep. All in all, a most unlikeable film. "The Hippopotamus" the novel came out in 1994. At the time the book was mildly shocking, moderately funny and quite witty. 23 years later and everything has changed, the storyline is slightly distasteful, the writing seems bland and the dialogue is pompous. 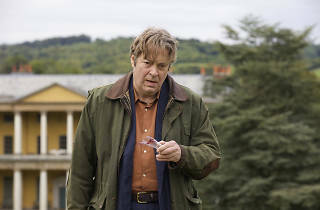 Roger Allam is good as Ted Wallace the washed up poet, but that is just about the only good thing about this film. It is free on Netflix, but I think I only stayed watching until the end because I was trying to figure out whether it was me, the medium or the times that had changed so radically in the years between reading and watching. Disappointing.